Closed for the 18/19 season! 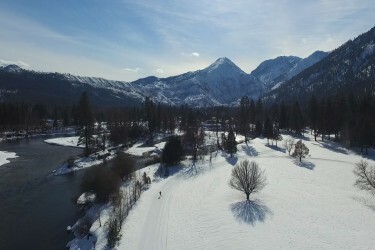 In this lovely setting the tracks and skating lanes climb hills to offer skiers spectacular views of the Wenatchee River below and the Cascade mountains beyond. They descend in wide sweeping curves or more thrilling direct runs to join the river before winding through open groves of huge pines to climb another hill. New this year at the Golf Course is snow shoeing! 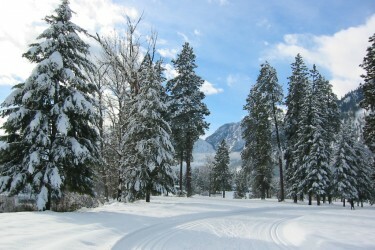 The Golf Course Snow Shoe Trail is marked and maintained by the footsteps of the users. The Trail fee is $10. Do not venture onto the ski trail. 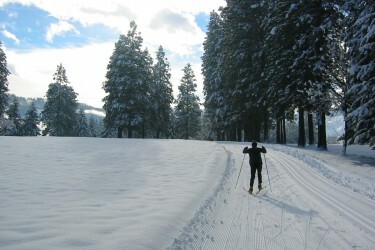 Snowshoeing is not allowed on the groomed skiing surface at the Golf Course. Available only at the Golf Course, is sledding! Bring your own sled and enjoy the ride. This is a great place to bring the family and young ones. 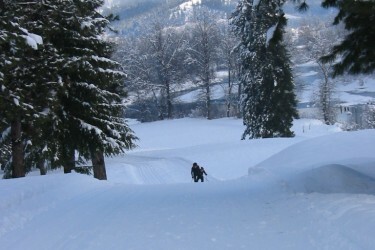 The sledding hill at the Golf Course will be maintained by LWSC. Sledding is only allowed in the designated sledding area. Sled area fee is $5. Do not venture onto the ski trail.